In one of the worst examples of timing in moviegoing history, I attended a screening of Jaws the day that it opened. What I had forgotten to take into consideration was the fact that I was scheduled to take part in the Boy Scouts’ Mile Swim in the Atlantic Ocean the following morning. To maintain as much distance between myself and Daryl Reynolds as possible. To swim the entire thing side-stroke. I’m absolutely mortified by it now, but at the time I rationalized my first goal by concluding that there was nothing in the Scout Handbook that forbad leveraging the laws of Natural Selection to one’s own advantage. I figured that Daryl, being a rather husky boy, would be the most likely to be mistaken for a seal or sea lion, so if some myopic Great White went for poor Daryl I didn’t want to get caught in the feeding frenzy. My second goal was based on the principle that by swimming on my side I presented a smaller target for any marine predators coming at me from below. 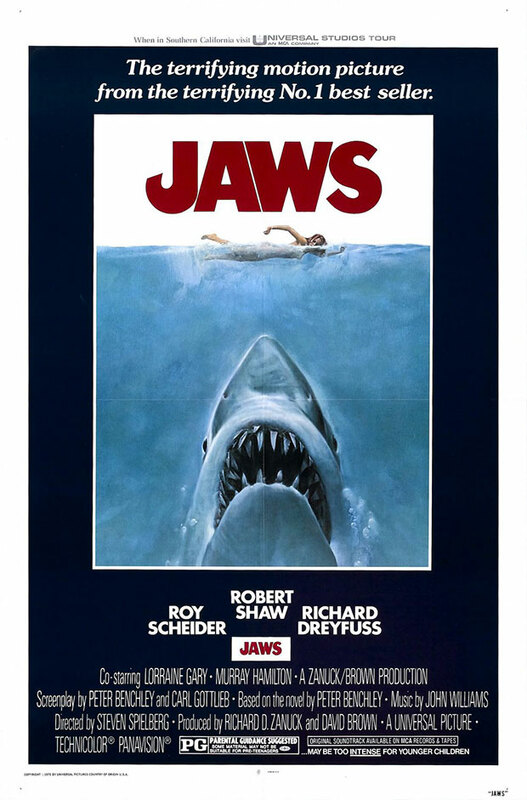 As anyone who has seen the one sheet knows, sharks always come at you from below. And, if it missed me on the first attempt, I might have enough time to swim over by the succulent Daryl and the shark might opt for him on the second go-round. The Succulent Daryl and I were the only ones swimming that morning, with our Scoutmaster and Assistant Scoutmaster following behind in a support dinghy, and I can only imagine how frustrating my survival strategy must have been for them. Fortunately for The Succulent Daryl, the Mile Swim went off without incident, except for the time when the support dinghy bumped up against my leg and I screamed bloody murder thinking it was a brush-by before the final attack. I may have even wet myself, but it’s kind of hard to tell when you’re doing the side-stroke.